This year sees The Terminator, Terminator 2 and Bill and Ted’s Excellent Adventures celebrate milestone anniversaries. And to celebrate, Creative Licensing Corporation is extending its licensing activity for the three classic titles, with a plethora of new partnerships. Marking 30 years of The Terminator, Fright Rags is producing a range of masks and apparel, while Poeticgem is producing a collection of apparel to roll out across Europe. Meanwhile, Funky Edit Wholesale is expanding its line of Terminator contact lenses, NECA will be producing further lines of The Terminator collectibles, while Sideshow is extending its line of high-end collectibles. As Terminator 2: Judgment Day celebrates its 25th anniversary this year, Simbat Toys will deliver a range of licensed construction toys to Russia, Nemesis Now is expanding its line of accessories across Europe and Sideshow is roiling out more licensed collectibles. 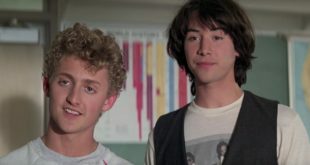 Also celebrating 25 years, Bill and Ted’s Excellent Adventure will now feature on a range of apparel across the US from ODM, while Park Agencies will roll out apparel across Europe. Although not celebrating such milestones this year, Evil Dead 2 will feature in a new range of collectibles from Sideshow and NECA. Sideshow will also produce a line of collectibles based on the Escape From New York movie. Finally, CLC has also signed with Park Agencies for a new European apparel range for Rambo.